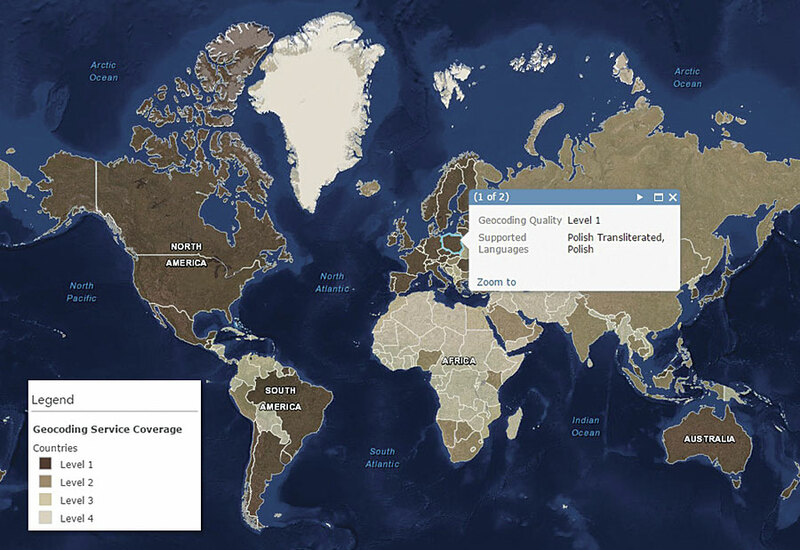 With Esri's geocoding capabilities, businesses can build mapping applications for international offices that use local languages and address formats. Location is becoming increasingly critical for many businesses. It can help find new customers and better support existing ones. Whether a business deals with patient records, utility bills, real estate properties, city services, or crime, most of its data contains location information. Leveraging this location information allows an organization to provide smarter access to health care, supply higher quality utility services, more aptly evaluate a property’s market potential, and more easily manage a city’s field operations and police patrolling. The most important step in making sense of location information is to turn business records into points on a map so the data can be analyzed spatially and business owners can gain critical location-driven insights. The process of converting location data into the latitude and longitude coordinates that are used to visualize data on a map is called geocoding. Equally vital to doing geocoding is being able to do it fast. This is why Esri recently increased the speed of its World Geocoding Service in ArcGIS Online by 230 percent, which also improves geocoding in other ArcGIS products that use the service, including ArcGIS for Desktop, ArcGIS Pro, and various SDKs. Additionally, for people who work behind firewalls, Esri is planning to release the World Geocoder for ArcGIS in the next few months, which will allow these users to geocode global addresses using one locator. Location information in business data is usually recorded as street addresses, city names, and postal codes—all of which take many forms that are frequently inconsistent. East Main Street could be abbreviated as E. Main St., some places exist outside city boundaries, and some addresses have ZIP codes while others don’t. Additionally, location information is often collected in the local language and its Romanized equivalent, which can be cause for confusion. Tour Eiffel in French is the Eiffel Tower in English, and the German word for street, straße, is actually strasse when transliterated into English. At times, people also prefer to search for locations by their names rather than their addresses, such as when someone looks for Starbucks in Los Angeles, California. Mapping volumes of business data—when a coffee shop wants to analyze information about 50,000 customers, for example—adds other complexities. The ArcGIS platform has very fast, global geocoding capabilities that take care of address formatting issues. And there are myriad ways businesses can use Esri’s geocoding capabilities to visualize their information. Keep Tabs on Global Operations. International businesses tend to have offices and distributors in various countries and customers all over the world. To help these organizations gain a complete picture of their global operations, ArcGIS can geocode at city level in 247 countries and territories and at address level in 107 countries in key markets, including North America, Europe, and Oceania. Let Local Offices Map in Local Languages. Employees at offices in different countries usually work in their native language. Thus, mapping capabilities for businesses need to work with various languages, alphabets, and writing customs. Esri’s geocoding crosses these language barriers by automatically understanding addresses in Roman and local alphabets, as well as making sense of local address formats. That way, businesses can build mapping applications that support international offices in the languages and address formats in which they are most comfortable. Esri has worked with its international distributors and partners to define the addressing for many key countries with complex addressing systems, including Japan, Thailand, and Israel. Ensure Analytical Accuracy. If location data is incorrectly mapped, spatial analytics and insights will be wrong, adversely affecting business decisions. Esri’s geocoding uses the most up-to-date and best available reference data from authoritative sources, such as HERE, TomTom, and local land authorities, assuring that organizations get the most precise, accurate, and reliable results globally. Use in Maps and Apps Straightaway. Organizations don’t need to process and build their own reference data; Esri has already gathered and processed global reference data—including streets and places—in one locator. This means that Esri’s geocoding is integrated with existing ArcGIS workflows. Using most ArcGIS products, users can input one address or place at a time to locate it on a map or enter multiple addresses at once to get their latitudes and longitudes and then put those on a map. Developers can also use the World Geocoding Service to add geocoding to the apps they build. Esri’s geocoding capability is fast and works across the ArcGIS platform. As a unified, ready-to-use service, it yields a consistent experience and uniform results. In the ArcGIS Online map viewer, users can search and locate addresses and places using the search bar, or they can drag and drop a spreadsheet of addresses onto the basemap to have them displayed. In ArcGIS for Desktop, the geocoding toolbar in ArcMap contains the geocoding services. And in ArcGIS Pro, geocoding can be accessed using the locate tool or by clicking on the binoculars. To make global geocoding easier for users operating behind a firewall, the World Geocoder for ArcGIS, currently in development, will enable them to geocode global addresses at a fixed cost using a single locator. This product will likely be available for purchase by the end of 2015 or beginning of 2016. Organizations with firewalls will still be able to geocode relevant business data by applying country-specific locators from StreetMap Premium for ArcGIS, as well as building and using locators based on their own reference data. For questions about geocoding, email geocoding@esri.com.